We conclude the series with NASA’s third — and perhaps the most difficult — design challenge for the students at the University of Minnesota to fashion an ergonomic Liquid-Cooling Garment (LCG). LCGs are essentially undergarments that keep an astronaut’s body cool. They incorporate a network of narrow tubes that channel cold water close to the astronaut’s skin. The cool water draws heat away from the body in order to maintain a comfortable core body temperature. In this last interview, conducted by Valérie Lamontagne of 3lectromode, Dr. Lucy Dunne explains the importance of understanding the body for designing wearables and the valuable role that aesthetics plays in the design of wearable technology. This design problem engages the whole body. Did this make it more challenging to design? L.D. : I think that all of the projects were fairly challenging in their individual ways. 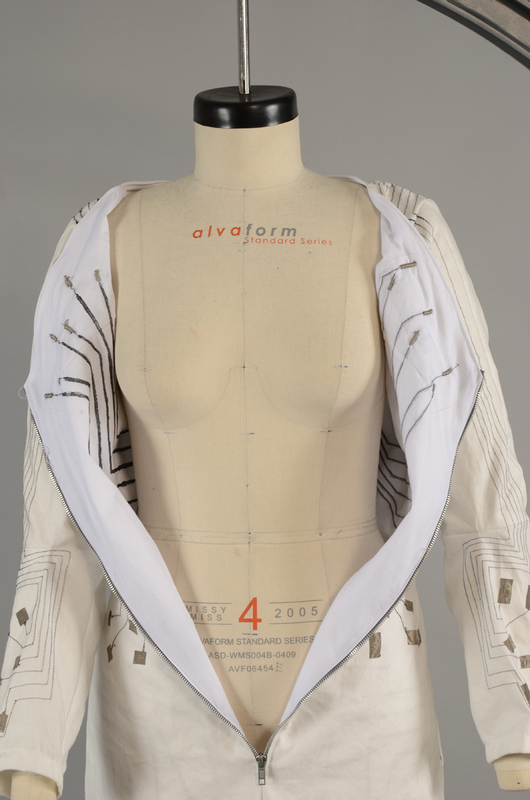 The challenges of this project were related to understanding anatomy, movement, and thermal transfer, and developing a method to integrate the tubing into a comfortable, mobile garment. Why is cooling efficiency important to extra-vehicular activities? L.D. : The temperature variability in space is extraordinary – several hundred degrees different in the sun vs. in the shade. Astronauts are also encapsulated in this contained environment, so when it’s hot there’s no way for the body’s natural cooling mechanism (sweat evaporation) to take place. 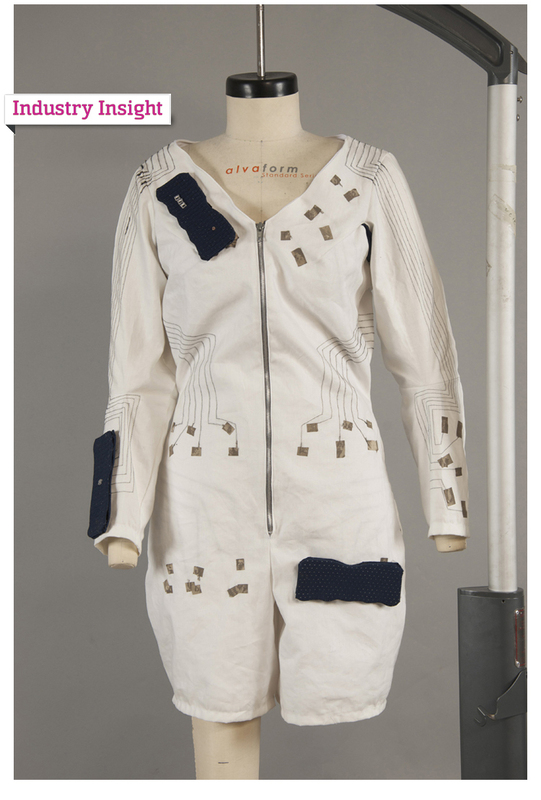 The cooling garment is one of the crucial elements that keep the astronaut alive and functional during EVA. One of the cautionary tales in Nicolas de Monchaux’s “Spacesuit: Fashioning Apollo,” is that it is more valuable to understand how to dress a body than pure engineering. Monchaux outlines how Playtex, a girdle-making company, wins out over engineering firms to create the suits worn on the moon by Neil Armstrong and Buzz Aldrin in 1969. Another key detail is the importance of the expert seamstresses in crafting suits to measure—adapted to the bodies and personal physiognomy of astronauts. What was your experience with the need to understand the body through design? Did you work with seamstresses? L.D. : We actually begin the course (every year, not just this year) with the Discovery Channel’s documentary about ILC Dover’s bid for the EVA suit contract. It’s an amazing story and one of the best examples of the challenges of merging apparel and technology out there. Understanding the body is absolutely crucial to designing anything that is worn, and even more so in extreme environments where elements of functionality are often directly at odds. Further, I believe NASA has moved away from the purely made-to-measure model, and currently uses modular units with sized components. A big part of the course the students participated in is learning about human anatomy, mobility, and comfort – and all of the physical and physiological systems that come into play. (These concepts are also essential in designing good everyday clothing!) This group spent a lot of time figuring out how to place stiff, bulky, non-stretch tubing so that it didn’t impede mobility, didn’t cause pressure points, and allowed the most effective thermal transport. All of my students are fully capable patternmakers and sewers by the time they get to this class, so there was no need to involve seamstresses. Understanding the body is absolutely crucial to designing anything that is worn, and even more so in extreme environments where elements of functionality are often directly at odds. You used Arduinos to develop your prototypes. Why was this the right choice for you? Does this mean I can build my own spacesuit at home? L.D. : Arduinos just eliminate a little bit of the hardware development process. None of the electronics we implemented were very complex — so the Arduino platform allows them to be more easily re-programmed and eliminates the need to set up the microcontroller part of the hardware. These are what could be called “proof-of-concept” prototypes – nowhere near space-ready! How important were the aesthetics of the designed suit prototypes? Do they need to convey the “idea” of space and technology much like the “metallic” suits of early space travel, which, according to Monchaux were for pure design and not functional purposes? L.D. : In the course we consider aesthetics as an equally important “function”. However, students have already completed 2.5 years of training in traditional apparel, which obviously focuses very strongly on aesthetics. So we don’t emphasize it as much as the new content in the course – but as I usually tell people, with apparel students there’s no need to “ask” them to take aesthetics into account, they do it very naturally and it would be impossible to preven them from focusing on that. We do however talk a lot about how aesthetic elements affect the functionality of a garment. There are a hundred examples of really effective functional and protective gear that are rendered completely useless due to aesthetics – because users either refuse to wear the garment entirely, or modify it to make it “look” better in a way that counteracts its functionality. Did you test out the prototypes on astronauts to get feedback on the usability of the systems? L.D. : Astronauts are very busy people and there aren’t too many of them in Minnesota – so no, the students didn’t interact directly with astronauts. Instead we found earth-bound users with similar sets of experiences – so for example, the group working on the space boot did user testing with police officers (who also wear pretty substantial footwear for long periods of time). How did you plan for redundancies in the system in case of failure of the circuit? L.D. : Because these are very new concepts, redundancies aren’t a concern yet. That’s something that would come into play once a system was more established. However, one of the objectives of the liquid cooling group was to build in a secondary backup-cooling loop that would keep the crewmember alive in the case that the primary loop failed. What do you think of new battery technologies such as “spray-on” batteries and energy harvesting? Have you tried them? They seem really well suited to your design challenges! L.D. : Interesting, yes! However, most of these non-traditional power sources don’t yet have the power capacity needed for these applications, and would pose a far greater integration challenge. Something to think about in 5 years, maybe! Much thanks to Dr. Lucy Dunne and Cory L. Simon for their insight and Valérie Lamontagne for conducting the interview.